The H160 mock-up is making its British debut today at Helitech, as the program steadily pursues its flight test campaign. The first prototype flights are progressing according to plan and the aircraft has already reached a maximum speed of 175 kts and an altitude of 10 000 feet. As the validation of technical parameters is followed closely, the flight tests also provide a perfect opportunity for the fully integrated ground support teams to optimise maintenance activities. The second prototype (PT2) is progressing as per plan since its power on in June. 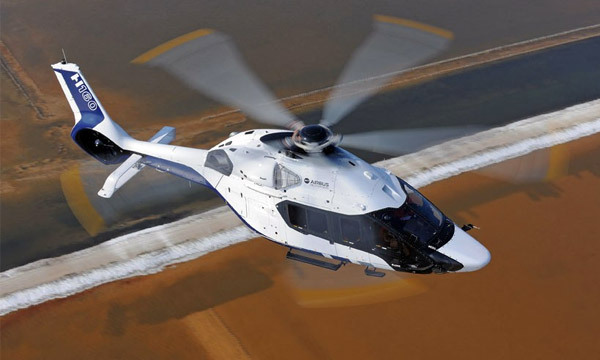 As one of the key priorities of the H160’s development program is maturity at entry into service, the Turbomeca Arrano engines will be installed and tested on the dedicated integration installation called the Dynamic Helicopter Zero before the PT2 performs its first flight by the end of this year. “The flight envelope opening of the H160 is well paced - thanks to the relevance of our investments in new generation test benches” said Guillaume Faury, CEO of Airbus Helicopters. “We are excited to present the H160 at Helitech and we are in a good position to begin its commercialisation next year, with the end objective of having a fully mature product ready to be delivered in 2018”, he added. A new generation 5.5 to 6-tonne twin-engine helicopter, the H160 will be tailored for a wide range of applications, including oil & gas operations, emergency medical services, public service, and private and business aviation. Placing customer satisfaction at the heart of its design, the program is continually working with customers on mission specific aspects, whether it is on the oil & gas segment or the VIP segment which just saw the launch of the H160 VIP interior design contest. Customers and opinion leaders will be at the heart of the innovative selection process.